Allium Sativum (Softneck) - Mersley Wight originates from the Auvergne in Central France across to the volcanic Drome in northern Provence. Its mountain provenance means it is best planted in early spring in the UK, from late November in the south thru to as late as the end of March. The optimum time to plant is mid February. It is a classic "silverskin" type, best late winter and spring planted, and with the best keeping quality of any garlic we know – Up till June of the year following harvest. That is 10 months. From the same collection of garlic that includes Solent Wight, Picardy Wight, Tuscany Wight, late Hungarian, Venetian and California Late, it has outstanding vigour and is larger and bolder than similar types. 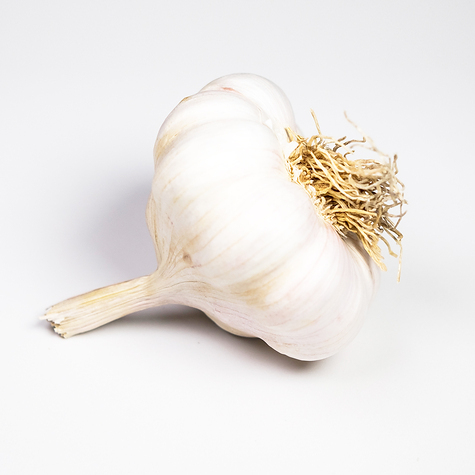 Mersley Farm is the home of Isle of Wight garlic and we have decided that this garlic, an outstanding garlic for the UK gardener, should carry its name. Selected from stock that includes the original Solent Wight, think Solent Wight but bigger with increased vigour. Plant the cloves 20-40mm deep, 12 to 15 cm apart, in rows 30 to 45cm apart root down, pointed end up into free draining soil. Mersley Wight will respond to 3 handfuls of Sulphate of Potash per metre length of row worked into the ground in the month after it emerges. Keep it watered from April through to approximately July 20th. Harvest should follow as soon as the plants bend over, go "weak at the knees", in the following three weeks, no later. Dig carefully under the plants with a fork or spade, lift the garlic and hang or place in trays in a warm, dry place – a conservatory, glass house or polytunnel or open covered area with free air movement. The garlic is ready when the neck is totally dry.